Artist's illustration of a Breakthrough Starshot probe flying by the potentially habitable exoplanet Proxima b. Some of the first spacecraft that humanity sends to other solar systems may carry microscopic ambassadors from Earth. 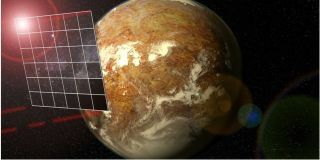 The $100 million Breakthrough Starshot initiative is working to develop the technology required to accelerate tiny, sail-equipped probes to 20 percent the speed of light, using powerful lasers. For example, Breakthrough Starshot adviser Jeff Kuhn, a physicist at the University of Hawaii, said that the project offers a great opportunity to investigate the feasibility of interstellar panspermia — the idea that life might have spread from place to place throughout the Milky Way galaxy, and perhaps even the larger universe. During a panel discussion on April 21 at the Breakthrough Discuss conference in Stanford, California, Kuhn noted that spores of the bacteria species Bacillus subtilis can survive for at least six years when exposed to the space environment. "I think it would be fun, on one of these disposable chips, to put a little colony of Bacillus, send it for 20 years, turn it on, give it some nutrients and see if it's still alive, just to experimentally decide whether or not panspermia works over interstellar distances," Kuhn said. That comment elicited a response from audience member Philip Lubin, a physics professor at the University of California, Santa Barbara, who's a key player in the development of Breakthrough Starshot's laser-propulsion system. "And there are certain organisms known as C. elegans, which we’re going to embed human DNA into and send them out and then awaken them on arrival," Lubin added, referring to a tiny roundworm species that's a common study animal for biologists. "However, I expect that will be a highly controversial thing to do." Life moving from world to world? The panspermia hypothesis posits that Earth life might have arrived, rather than originated, here. This idea is not as fringe as you may think. For example, some scientists argue that, in the ancient past, the Martian environment was more conducive to life's emergence than that of Earth. And it's not terribly uncommon for the two planets to exchange material, in the form of rocks and dirt blasted into space by asteroid strikes. Orbital dynamics dictates that it's much easier for Martian stuff to reach Earth than the other way around, so we may all be Martians, according to this line of thinking. But there are a number of factors that could make it difficult for life to move through space. Then, there's the issue of time, which makes interstellar panspermia unlikely, according to Harvard University astronomy professor Dimitar Sasselov. "With the short-lived universe we live in, the more likely scenario is that most of the planets that we'll see life on are also the locations where it emerged from the planetary conditions," Sasselov, who's also the founding director of the Harvard Origins of Life Initiative, said during a different panel discussion at Breakthrough Discuss on April 20. The transfer of organisms between nearby planets in the same solar system is feasible, he added. But interstellar panspermia "just takes too long, and it's too far of a journey, and the probabilities currently, in the current universe, are just too small," Sasselov said. All of the above speculation assumes naturally occurring "accidental" panspermia. But it's also possible that intelligent aliens could set panspermia in motion, either unintentionally (via contaminated spacecraft) or intentionally (in an effort to seed other worlds), some scientists have said. Breakthrough Starshot, and projects like it, could give humanity this ability as well. "We can be the panspermia which actually seeds other planets if we want," Lubin said. "And it's something to think about for the future."